Yes it's the spookiest day of the year once again. 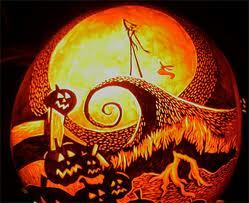 Happy Halloween to you all! This is my favourite day and to celebrate with you, I thought I'd share my favourite Halloween film of all time. If you haven't seen it, yet, it's the perfect one to watch after the trick-or-treating is done, or even during the Halloween party. Set's the tone for the rest of the winter season. 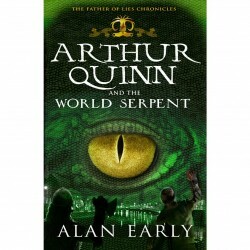 And... if you haven't found the website yet, here's the link you need to learn much, much more about the world of Arthur Quinn, the dangers that lurk beneath the streets of Dublin, the awakening of the Viking gods; plus you can download a screen saver, print off a Rune bookmark, play games, ask the Norn about you own destiny. It's simply fantastic! Free this weekend, October 22-23, The Guardian and Observer will be including 'Reading With Kids', a great two part guide loaded with expert advice, useful ideas and tons of information and book suggestions on books for children from picture books right through young adult novels, all to help nurture that love of books and reading. Saturday, the first part will include input on books for ages 0-7 years. Sunday's second part will give information on books for ages 8+. The link below will take you through to a great video of children telling you how important reading is to them... why they like it, what challenges them, where their favourite place to read is...fantastic! Look for 'Reading With Kids' this weekend. Not only will it help you help your kids, but it's just in time for helping you with t hose gifts you'll be looking for very shortly! Also, here's a link for a brilliant article posted ahead of this weekend's 'Reading With Kids'. Lucy Mangan considers 'What makes a classic?' when it comes to children's books. Why do some books last for generations and what is it they have that others simply don't? Mangan discusses the dynamics of the 'two audiences' that are involved in the reading of children's books... essentially, adults, most likely parents and other 'learned' grown-ups and the intended audience, children. It always fascinates me that we adults spend so much time hashing over the merits and demerits of children's books. Frequently, we forget that the ultimate voice in this discussion of what makes a children's classic or even a really good kids book is in fact, the voice of the children. "Nevertheless, not every old, well-written, "worthy" book becomes a classic. Why not? Because of that other audience – the child readers. 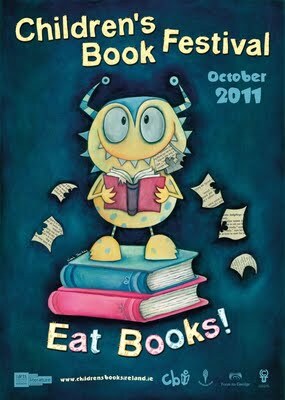 Ultimately, the books have to be read, and re-read, by children." A brand new radio programme is on this interether this morning. (In fact, I'm listening to it as we speak.) This programme, presented by Grainne Clear, shares children's books, old and new, with its' listeners. Beginning with The BFG by Roald Dahl, the listener is treated to readings and poignant discussions, geared towards children of all ages, some of which are read by children! It's just brilliant to hear children in discussion about children's books. They explain what they want and expect and perceive out of books/literature with such clarity. Refreshing and wonderful, this show is scheduled for every Sunday morning at 9am, then repeated each Friday at 5pm. And it's 15 minutes well spent, I assure you!!! "how picture books work, why children like to be scared, the childhood love of the grotesque and bizarre, and many other themes which will help parents understand the workings of children’s books". Get yourselves down to Quay Street between 2 and 5pm tomorrow (that's Sunday, October 16th) for the amazing Opening Party of this year's Baboro International Arts Festival for Children. Das Papiertheatre from Germany will be creating an art installation in Galway City Centre and the streets will be teaming with party atmosphere! Mr. Whippy Soundsystem, street games, music, art... all in celebration of Baboro's 15th year! And it's all FREE! You've just got to be there!!! I'm just as pleased as I can be to tell you that I've got another review published in 'The Bookbag.' In case you haven't heard of 'The Bookbag', this is an online site that publishes TONS of wonderful reviews, children, adults, fiction, non-fiction... just about anything you could be looking for. Here's a quote from their 'About Us' page, just to give you a real sense of what they are about. "Firstly, and most importantly, we would like you to think of The Bookbag as a homely, comfortable place. The corner of your local library perhaps, where you can relax in convivial company and find some suggestions for books to read. We don't have an 'angle'. We're not looking to force feed you the latest books on the shelves. We're not tied to a particular genre. We're not interested in what's fashionable. We just want to share our thoughts with you, if you'd like us to." And now, I've got a comprehensive review of 'Fly By Night' by Frances Hardinge...one of my favourite books by one of my favourite authors published, along with my review of 'The Butterfly Heart' by Paula Leyden... a simply beautiful book that must be read! Very chuffed with myself, I must say. And very grateful to Sue and Jill at The Bookbag. Little Island Presents.... Annie Graves! Annie Graves is twelve years old, and she has no intention of ever growing up. She is, conveniently, an orphan, and lives at an undisclosed address in the Glasnevin area of Dublin with her pet toad, Much Misunderstood, and a small black kitten, Hugh Shalby Nameless. You needn’t think she goes to school – pah! – or has anything as dull as brothers and sisters or hobbies, but let’s just say she keeps a large cauldron on the stove. This is not her first book. She has written four, so far, none of which is her first. And I have to say, the books are great.. truly creepy, but great. So if you're planning a bit of a story-sharing party for the season, may I suggest that you check The Nightmare Club series. There are four so far, but Annie herself assures us that there will be more. Here's a wonderful video visit with Eric Carle (The Very Hungry Caterpillar) in celebration of his new picture book, 'The Artist Who Painted a Blue Horse'. Inspired by the work of Franz Marc, the famous Expressionist painter and founder of the artists' group 'Der Blaue Reiter' (The Blue Rider), this vivid, lively picture book is a unique celebration and encouragement of the imagination. Futa Fata is proud to announce the launch of a new picture book ( in Irish)! This Saturday, 8th October at 12 noon in the Galway City Library, Augustine Street, Galway; Leo Moran (The Saw Doctors) will officially launch BINJI - Madra ar Strae, written by the wonderful Patricia Forde and illustrated by Brian Fitzgerald. 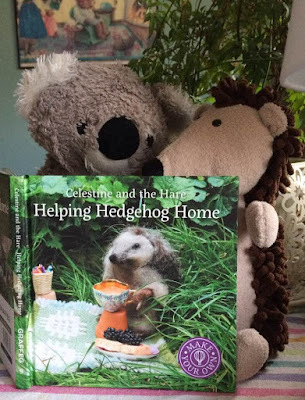 Patricia is the author of Frogs Do Not Like Dragons and it's sequel, Hedgehogs Do Not Like Heights, as well as the thoroughly delightful Citi Cearc. All are welcome to attend, especially children. Look forward to seeing you there. 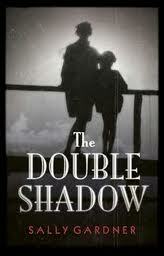 I recently read the proof copy for Sally Gardner's new book for young adults, The Double Shadow and, I have to say, it was fantastic! Sally Gardner has become one of my favourite authors, regardless of the age group she's writing for. I, Coriander was absolute magic, and quite a few schools in the area use it as a class novel. The Red Necklace, which is a younger teen book that takes place during the French Revolution paints a very powerful picture, not simply of the time, but also of the mindset of the people in the context of their surroundings. With this new book, Gardner offers us a gripping psychological/family portrait combined with a science-fiction thriller that is outstanding. Coming in November, Orion have just released the trailer. 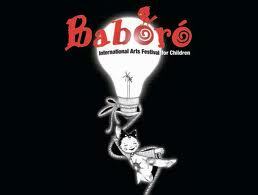 ...and the Baboro International Arts Festival for Children will run from October 16 through the 23rd, right here in good old Galway! Happy October... remember, it's BookFest time. Children's book related events are happening all over Ireland!